From holiday parties to family get-togethers, you're sure to get your guests attention with this eye-catching maple bread board from McClure Tables. 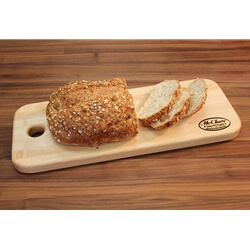 Handcrafted in our Grand Rapids, MI factory with locally harvested Michigan hard maple, this bread board is the perfect surface for slicing your favorite bread, or put it to working serving your favorite party foods and hors d'oeuvres. Constructed using edge grain wood, our durable maple bread board is tough enough to withstand frequent use yet beautiful enough to be kept out on the counter.